StandUpPouches.net, a leading supplier of flexible retail packaging, announced it has put a plan in motion to assist manufacturers with retooling their product packaging so it properly complies with updated Nutrition Facts label requirements introduced by the FDA. Labels and packaging must be updated on all applicable CPG products by July 26, 2018. A refreshed design, highlighting the product’s caloric content and serving size, is among the notable label changes introduced by the FDA. Declaring added sugars, Vitamin D content and potassium content are also among the updates. According to the FDA, package size affects what people eat, and serving size has changed since the requirements were first published in 1993. As a result, one of the administration’s required updates involves producing packaging so it is a realistic representation of a single or double serving size. For products larger than a single serving, dual columns must be printed on the package to indicate nutrition content on a per-serving and per-package basis. Because of the increased desire for more transparency, consumers look to a product’s package for information about the items they purchase and origins of their ingredients. Brands must now place a special emphasis on their product’s package as a way to educate and communicate to the general population and avoid misleading, false or confounding claims. StandUpPouches.net offers several services for brands in a wide range of markets to update their product’s package to reflect these changes by 2018. By completing this short form , new packaging can be produced that is smaller or large enough to reflect the newly mandated one-serving-size requirement. 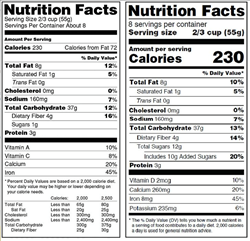 While it is the responsibility of each company to produce new labels for individual products, the packaging supplier is able to reprint existing custom flexible packaging to include the updated Nutrition Facts information by the required date. Because the packaging supplier specializes in flexible options, such as stand up pouches, spouted pouches and flexible box bags, the team can also guide new companies through the process of switching from rigid containers to flexible packaging for a wide variety of consumer packaged goods. The supplier also plans to aid customers currently using stock flexible packaging through the process of shifting to custom printed pouches that clearly display the new Nutrition Facts label on the outside of the package without the need of additional stickers or applied labels. Using a rotogravure printing process, custom pouches from StandUpPouches.net display text, graphics and colors on the outside of the package in crisp, vibrant detail using water-based inks. All flexible retail packaging from StandUpPouches.net is FDA approved, allowing brands to remain compliant not only with their updated Nutrition Facts labels but also in terms of their packaging structure. The supplier is a leader in full supply chain management and has proven success as a strategic marketing, branding and packaging partner to businesses across the globe. StandUpPouches.net is a leading online supplier of flexible retail packaging solutions for many of the world's largest brands. By partnering with small and mid-market businesses, the company has helped its customers build their brands and successfully market their products using the finest printed pouches in the industry.